Basically it means gathering bit by bit, and can be relating to either information or objects. But, it also has a historical meaning of gathering leftover produce after a harvest. In this day and age, however, it is a term that is also used not only just for leftover produce, but for thrown away or totally unused produce (or even other food items, for that matter). Dumpster diving can even be considered a form of gleaning. Healthy Food for All is a community-based food recovery effort. We collect excess produce from farms and prepared foods from corporate cafeterias that would otherwise go to waste. We clean and repackage this food at the FEED Kitchens and then distribute it to food pantries and neighborhoods all over Madison, WI. 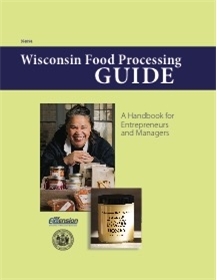 The Wisconsin Food Processing Guide presents a comprehensive array of topics that must be considered by the food entrepreneur. It provides a point of reference and reflection for those starting up, scaling up, or even those who are just dreaming (120 pages; 2016).